This is a Starlink: Battle for Atlas review. You can find this game and other great deals at Best Buy right now! The holidays are in full swing, and that means scoring cool toys for your kids. With so many games and toys coming out all the time, it’s hard to really get down to what’s worth spending your change on and what’s not. Well, fear not! I teamed up with my kiddo, Gauge of ShadowGamingAr on YouTube, to review one of this season’s hottest new games for kids, Starlink: Battle for Atlas. The new modular toy game which allows players to create and customize your own unique starship, battle, explore new worlds and creatures and play your way. Collect more ships and pilots for an entire fleet! Spoiler alert, he loved it! Starlink: Battle for Atlas is the gaming world’s all new modular toy technology game. It’s a beautifully rendered open-world space saga which gives kids ages 10+ the ability to assemble and customize real-world physical starships that link to their game controller, and adventure across the Atlas star system. Play single or two-player split screen local co-op. Each modular component and pilot attached to the starship appears instantly in-game, allowing interactive play between the toys and the game itself. Starlink: Battle for Atlas is available on Nintendo Switch, the PlayStation®4 and Xbox One. Right now through December 8th at Best Buy you can save $25 on Starter Packs. Plus, buy one get one 50% off all Starlink toys. Shop now! From December 16th – 22nd you can save $25 on Starter Packs. Plus, save 30% on Starlink toys. I gave this to my son for his birthday. I’m not a gamer, but he stays in the loop with what’s coming out and what looks cool. He immediately knew what it was and said he was excited to try it, that he had been looking at it since it was released. Go me! I had no idea! He was super excited to see that it had the Star Fox story mission. We have Starfox for our older Nintendo console and so it’s a bit of a cool throwback to older games. Right away I could see that the graphics on this game were pretty cool. Lots of bright colors and space stuff going on. I’m a fan of space so that really caught my eye. The opening storyline was cool too. Right away I was in a combat mission which was more like a practice round. I was flying through space and had to shoot my enemy targets. There’s something about shooting lasers in space that’s just downright awesome. I learned that I could switch my Starship weapons out mid-mission and it changes in the game in real time. That’s really cool because it’s interactive and gets you moving parts around rather than just sitting there with a controller. I also find it to be pretty challenging which is awesome. Other modular toy games aren’t quite hard enough for me, so I grow bored with them. But this one is exciting and not so easy to play which keeps me interested. The second mission was a little more difficult than the first, but once I got used to the sensitivity of my starship I was good to go. I really like the graphics. As with any modular toy game, getting the toys for this can get expensive, but, they also make great gifts. I find that when I’m buying birthday or Christmas presents for my son, it can sometimes be a challenge. This makes gift giving pretty simple for me and other family members who want to get him something cool that he’ll enjoy. Also, they make for great incentives to get good grades and have good behavior. And I’m all about incentives. So in the bigger picture, they are fun to collect and make the gameplay even more interactive. The Starship Packs run $24.99 and the Pilot Packs run $9.99. I think this is a great buy for anyone who has kids that love to game. And even if they aren’t total gamers, this is a clean, kid-friendly game that will be enjoyed for a long time and the gifting opportunities are many. Be sure to pick yours up while it’s still on sale at Best Buy! Remember, now through December 8th you can save $25 on Starter Packs. Plus, buy one get one 50% off all Starlink toys. Shop now! And from December 16th – 22nd you can save $25 on Starter Packs. Plus, save 30% on Starlink toys. 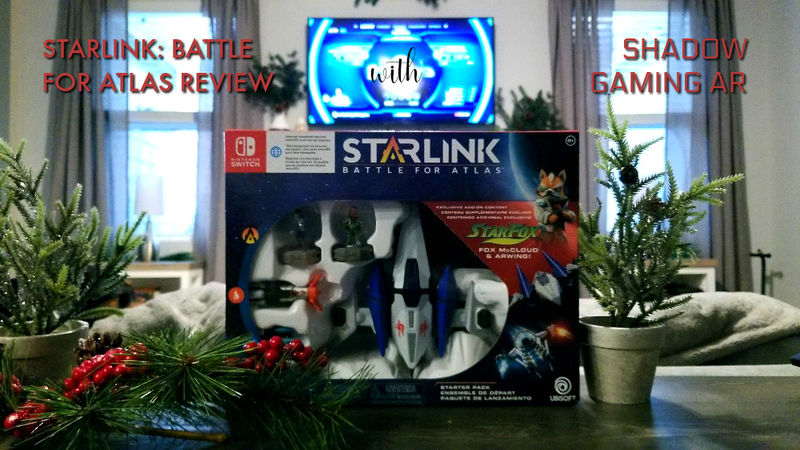 I hope you liked this Starlink: Battle for Atlas review from myself and Gauge at ShadowGamingAR. Be sure to follow his gaming vlog on YouTube! I really happy to find this website on bing, just what I was looking for besides saved to bookmarks. Thank you! I’m so glad you love it.